It's easy to order Wild Touch® products. Please visit our webshop or visit one of our dealers who can advice you and order for you. Click on the design version of the product you want. You supply all game hide for the product. You supply some of the game hide to be used for product and Wild Touch® delivers the rest. For example if you have a piece of back-skin from an Impala and whish to get a product made of elephant leather with decoration of Impala skin. 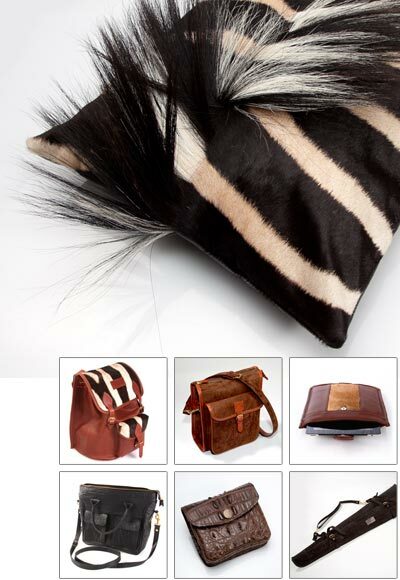 Or a piece of hide from a Mouflon and whish to get a product in combination with Italian cowhide. The combinations possibilities are endless. Game hide supplied by customer in combination with Cow leather supplied by Wild Touch®. Game hide supplied by customer in combination with Cape Buffalo leather supplied by Wild Touch®. Game hide supplied by customer in combination with Elephant leather supplied by Wild Touch®. Game hide supplied by customer in combinationwith Hippo leather supplied by Wild Touch®. Game hide supplied by customer in combination with Ostrich leather supplied by Wild Touch®. Wild Touch® deliver all game hide for the product. Wild Touch® deliver all leather and fur for the product. Cow leather + Spingbok fur. Cow leather + Zebra fur. Elephant leather + Springbok fur. Ostrich leather + Zebra fur. When your product is ready for dispatch with GLS (General Logistic Systems) Parcel Service, you will receive an e-mail with the Track & Trace” code in order to follow your parcel on it way to you.